I am going to use a very old-fashioned word to describe ‘The Almanac – a Seasonal Guide to 2019‘ by Lia Leendertz and that is “spiffing“. 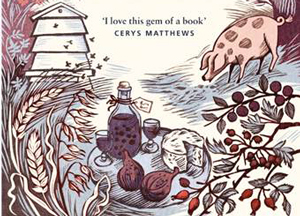 This gem of a book follows on from Lia’s 2018 Almanac which was a big hit with readers eager to connect with the British seasons. There is so much packed into this compact little volume that I am utterly impressed at how the author has managed to garner so much useful and interesting information into such a small book. However, this is part of the charm of ‘The Almanac‘ – a perfect toolkit connecting with the world around us and the year ahead as it unfolds – all in a compact and pocket size that just begs you to pick it up and browse. Each month, Lia includes things that make that month feel special: festivities, developments in the garden, natural phenomena and seasonal foods, as well as tides, weather, moon phases and sunrise and sunset times. At the start of each month we learn where the month’s name comes from to be followed by a short tale appertaining to some aspect of the month – these I loved. For example, at the start of February we get a Chinese New Year Story, a Traditional English Story for May and a Hindu tale for September. Another aspect that makes this book so attractive is the illustrations – specially commissioned from artist Celia Hart. Her beautiful and unique prints of animals, birds, gardens and landscapes are hand printed using traditional techniques, inspired by Japanese and Chinese printmakers and the English tradition of the illustrative print. They are a joy in themselves. 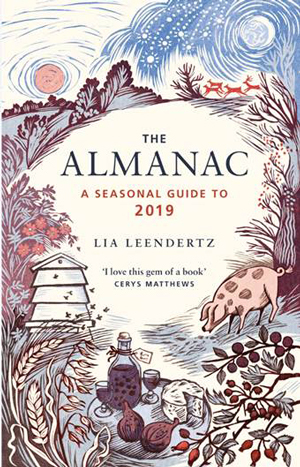 Lia points out that ‘The Almanac‘ offers ways of appreciating the natural rhythms of the year no matter what your energy level or inclination: “If you want to get out for a country walk at bluebell time or to watch the sunrise at dawn on midsummer’s day, then yes, this is the book for you,” she says. However, Lia also points out that if you simply want to sit by the window and spot Mars alongside the crescent moon (January) or eat strawberries when they are at their peak (June) then you will also do well to have the ‘The Almanac’ at your side. It’s just perfect as a stocking filler but also one book that you will feel is well worth spending the £10 cover price on for your own personal bookshelf. In fact, its range of information and depth of understanding of our seasons is priceless. Lia is an award-winning garden and food writer who contributes regularly to the Guardian, the Telegraph, Gardens Illustrated and The Garden. She is author of several gardening books and the cookbook, ‘Petal, Leaf, Seed: Cooking with the treasures of the garden‘. She also has a monthly almanac spot on BBC Radio 6 Music with Cerys Matthews. So I return to my original adjective when I say this is a “spiffing” book and one which I will be keeping by my side right through next year. ‘The Almanac – a Seasonal Guide to 2019‘ by Lia Leendertz is published in hardback by Octobpus books – www.octopusbooks.co.uk – at £10.00 and is available from 6th September 2018. The reviewer is grateful to the publishers for a review copy of this book.